Notes from behind the bar: cold brew coffee. 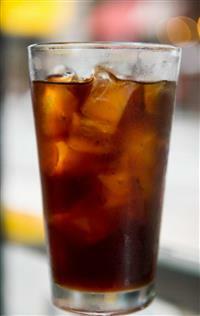 Iced drinks of various kinds are available to you morning, high noon and night. Up until a couple of years ago, a favorite (and necessary) start to a summer day for me was an iced coffee, quickly gulped so the caffeine could go ahead and start its work. I’d pour some espresso over ice and think that’s all the world could offer me in the early hours. I was reasonably content. Then we started making cold brew coffee here at Food Dance. Cold brew, you say? I call it iced coffee, but que sera, they’re the same thing…right? Oh no, and as in love, chemistry has everything to do with it. I never thought about nor used to care what happens when two-hundred-degree water hits coffee grounds, I just wanted the coffee, but apparently, hot water and cool, filtered water affect coffee grounds very differently. The fatty acids and oils that are released at high temps aren’t if you soak coffee grounds in cool water, and let them sit a day at room temperature. This ‘cold brewing’ gives you a product that is smoother, fruitier, much less acidic and therefore seems sweeter than regularly brewed coffee. Can’t imagine drinking coffee without spoonfuls of sugar and cream? Try cold brew without any; you’ll be amazed. The sweetener and dairy you used before to balance the acid and bitterness may not be necessary. Making cold brew coffee is easier than you may think. It just requires patience. To start, slowly mix four ounces of your favorite coarsely-ground coffee with 2 ½ cups of water. Slowly, because you want to allow the coffee to ‘bloom’ and release its wonderful aromatics. Blooming happens when you add only enough water to dampen the grounds and let it sit for a bit before adding the rest of the water. (about 10 minutes for cold brew). This allows the carbon dioxide that gets trapped in the beans during roasting to be released. The fresher the beans, the bigger the ‘bloom’- which looks like the grounds are swelling up- because carbon dioxide will be released naturally over time. Once the coffee has bloomed, add the rest of the water to the container, be it a mason jar or Tupperware, seal it and leave it at room temp for 18 to 24 hours. This is where the patience comes into play. A day or two later, strain the coffee through a paper filter (it may need to be strained twice to remove all the grounds), and now you’ve got cold brew ‘concentrate’. Add another 2 ½ cups of water, more or less to taste, and you’re ready to start sippin’.